Change is dangerous. I devote an entire section of my book, “Squish Creativity Like a Bug,” to revealing the danger. But I failed to heed my own advice. You see for the last couple of years my adult son, Rocky, had wanted to take the Florida Motorcycle Safety Course. 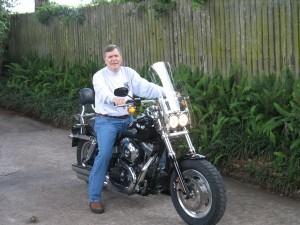 This is required by law to rent and/or ride a motorcycle. His Wife and Mother objected. In college I had owned and ridden a Honda 350. So this past Christmas I gave Rocky a gift certificate for the course. We took it together. It rained all day the last two days of our training. This was obviously a clear sign that we shouldn’t proceed. But I had completely forgotten about the wise words from my book. We both passed the course and planned a trip along Crystal River on the west coast. The first date, April 26th, was washed out by another rainy day. Hello… what does it take to get my attention? Monday, May 3rd came and the sun was shining. Rocky and I roared of the driveway with anticipation and excitement. We were doing something different… a change from the routine! I wasn’t thinking like a Boss. I let silly ideas like adventure, relationships and exciting change cloud my thinking. Look at the smile on my face in this picture. What an idiot I was! I used a vacation day, leaving a weak middle manager in charge. This way I was assured that no major decisions would be made in my absence. Now you might think I was considering all angles, as a strong Boss should. If you have come to that conclusion, you are missing the point. Look at the picture on the right. 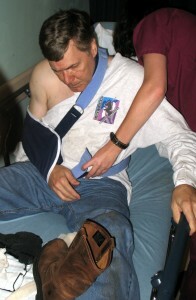 That’s me on a gurney in the emergency room with a totally wrecked right shoulder. The road we traveled was full of unknown curves. The final one was so tight I left the road and went down in someone’s front yard. The surgery left me with a steel plate and eight screws holding my shoulder together. I was unable to return to work until September 7th. For you non-bosses who lack math skills that is four months of painful physical therapy. Four months of sitting at home – away from the office. Four very long months of doing what I was told, taking my medicine, painful exercise, and not being the Boss. During my extended absence the numnut I left in charge reorganized my department. He gave other middle managers authority to change procedures. He began holding “feedback” sessions with the employees. He even put in a suggestion box! Worse that putting up the stupid box, he actually read the suggestions!! And horror of horrors made changes based on employee input!!! Suddenly the employees began to feel listened to. They started to believe their opinions mattered. Creativity, initiative and innovation grew like poisonous weeds. Upon my return, it took the entire month of September to get things back under control. Fortunately, when I resumed command and began undoing all the harm numnut had caused, he quit. Actually several employees left with him… good riddance! The remaining peons understood the folly that was engaged in during my absence. They quickly returned to focusing solely on the tasks in front of them. Initiative and creativity immediately decreased to acceptable levels. The lesson I learned from this is where I started: “Tried and true is right for you.” The business world is full of dangerous, unknown curves. Veering off course has dire consequences. Don’t let family relationships or the false hope of excitement lure you off the path of a true Boss. Rick Highsmith is a Florida Keynote Speaker and trainer who has audiences roaring in laughter as his alter-ego, Steele Steadiman, a boss’ boss. In addition to great articles and tips, Rick teaches great workshops listed on his website at https://www.leadersinstitute.com.